After brief battles at Lexington Green (5:00 a.m.) and Concord’s North Bridge (9:30 a.m.) fighting escalated along the “Battle Road.” As the British troops marched back towards Boston, militia companies poured in. By afternoon, nearly 4,000 Colonists unleashed “an incessant fire” upon the British soldiers. At the end of the day, the Colonists surrounded and laid siege to Boston. The Revolutionary War had begun. Location. 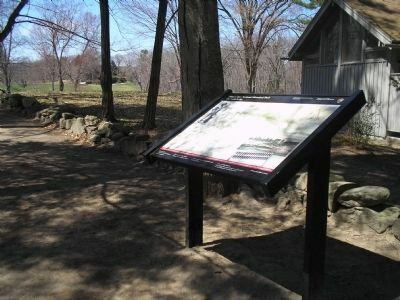 42° 28.164′ N, 71° 20.934′ W. Marker is in Concord, Massachusetts, in Middlesex County. Marker is on Monument Street, on the left when traveling north. Touch for map. Marker is located at the start of the trail to the North Bridge. Marker is in this post office area: Concord MA 01742, United States of America. Touch for directions. Other nearby markers. At least 8 other markers are within walking distance of this marker. Concord Battle Monument (about 400 feet away, measured in a direct line); Grave of British Soldiers (about 400 feet away); Concord Fight (about 400 feet away); The Minuteman of Concord 1775 (about 700 feet away); Captain Isaac Davis (approx. 0.2 miles away); Two Revolutions (approx. 0.2 miles away); An Evolving Legacy (approx. 0.2 miles away); Reflections of the Revolution (approx. 0.2 miles away). Touch for a list and map of all markers in Concord. More about this marker. 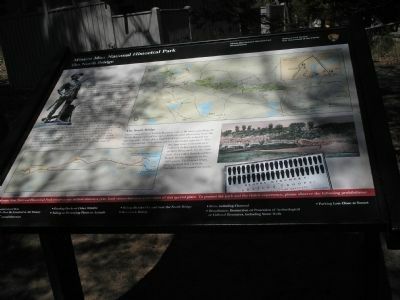 The top of the marker features a map of Minute Man National Historical Park, with a detail of the trail from the marker to the North Bridge. The bottom left of the marker contains a map of the British march on Concord on April 19, 1775, with the progress of the British retreat indicated: 1. British leave Boston – 10:00 p.m.; 2. Paul Revere and others Spread the Alarm; 3. Lexington Green – 5:00 a.m.; The North Bridge – 9:30 a.m.; 5. The Battle Road: Meriam’s Corner to Charleston – 12:30 p.m. to 7:00 p.m. 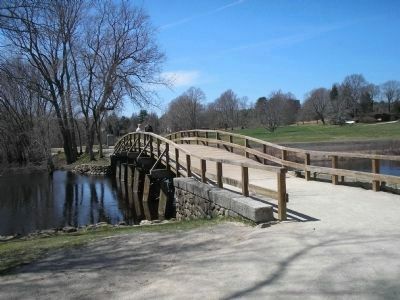 The American Revolution began on April 19, 1775 at this bridge when Colonists fired on British troops for the first time. 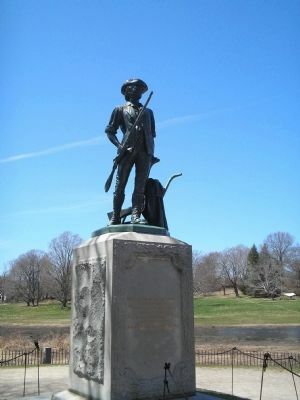 This Minute Man overlooks the North Bridge in Concord. More. Search the internet for The North Bridge. Credits. This page was last revised on June 16, 2016. This page originally submitted on April 27, 2009, by Bill Coughlin of North Arlington, New Jersey. This page has been viewed 1,174 times since then and 10 times this year. Photos: 1, 2, 3, 4. submitted on April 27, 2009, by Bill Coughlin of North Arlington, New Jersey.